Horiatiki Salata, which means village or peasant style salad, is widely known as “Greek Salad” and is a common component of a Greek meal. In Cyprus, the Cypriot Greek Salad is enriched with more ingredients such as fresh coriander, rocket, capers, lettuce and purslane and other ingredients, depending on the season. 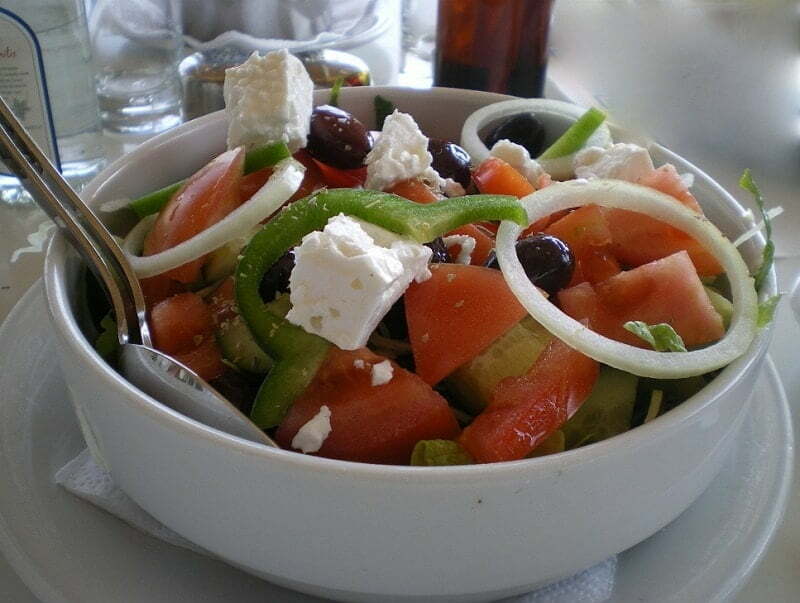 Greek salad is always on the Greek table. Years ago tomatoes were only available during summer but now we have them year around and can enjoy this salad any time we like. It can accompany any meal but if you want to eat something light, it can also be a healthy meal on its own. This village salad is the focal point of the Mediterranean Diet. It has vegetables, tomatoes, cucumber, peppers, onion, protein from the feta and olives and olive oil, which is the main fat used. All these ingredients make a delicious salad and provide us with lots of vitamins and other necessary nutrients. The olive oil helps to lower cholesterol (LDL) and its antioxidant properties is a shield against heart attacks. In antiquity olive oil was used to cure muscular pains and skin disceases. On the other hand tomatoes are also a good source of antioxidants and lycopene and the onion is a good source of flavinoids, which again helps to rise the good cholesterol (HDL) and prevent cardiovascular disease. A usual serving of Greek Salad has about 300 – 400 calories because we add quite a lot of olive oil. You must be extra careful not to mop up those juices with too much bread as it will add up more calaries. If you are on a diet and want to eat a Greek salad, add a small piece of feta, less olives and less olive oil. Wash and drain the vegetables. Cut the tomatoes into bite size wedges, cut the cucumber into round slices, cut the onion in the middle and then cut it into thin slices and then after deseeding the pepper cut it into thin slices. Add olive oil, vinegar, oregano and salt and mix well. Add a block of feta on top and drizzle some more oregano and olive oil. When serving, break the feta into smaller pieces and mix the salad again. Horiatiki Salata, which means village or peasant style salad, is widely known as "Greek Salad" and is a common component of a Greek meal.